Growing up we didn’t have store bought treats in the house. When my brothers or I were offered a Little Debbie at a friend’s house, we were all over it. 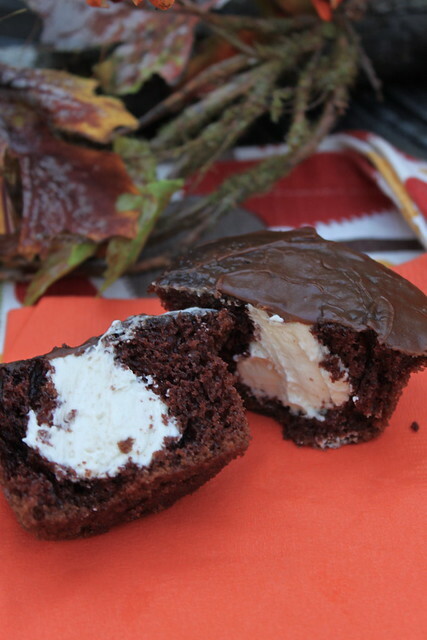 What we did have at home were amazing homemade desserts every so often, and those most definitely trumped any Little Debbie treat. 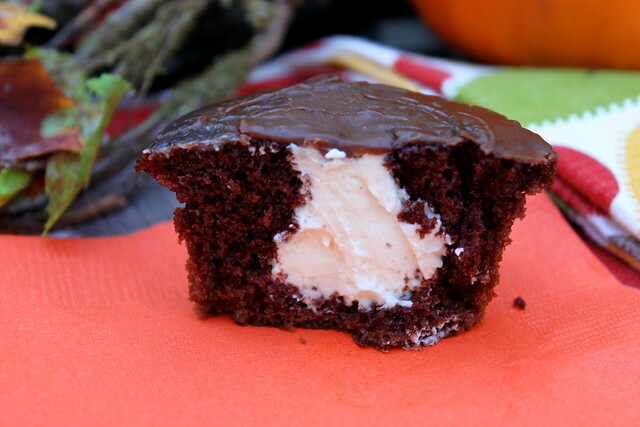 One of my all-time favorites were Cream Filled Chocolate Cupcakes. Oh gracious, are these fantastic. 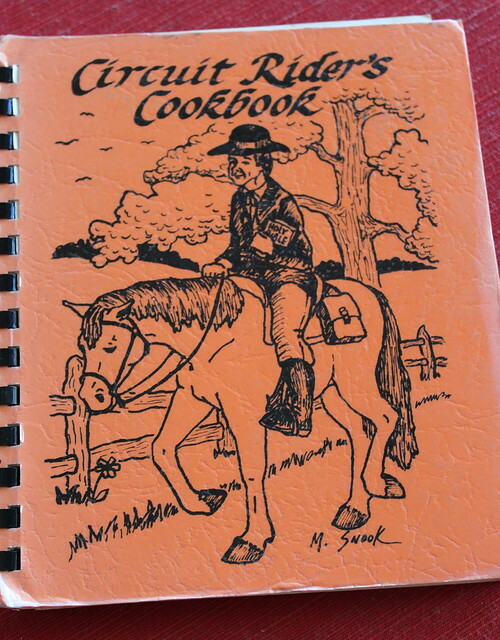 My mom got the recipe from a cookbook created by a Sunday school class at our church, called the Circuit Rider’s Cookbook. As a little background, a Circuit Rider was a Methodist minister that would ride on horseback from rural church to rural church to preach the good news. Well if you know anything about church ladies, you know they can cook, so this little well-loved cookbook has some real gems in it. 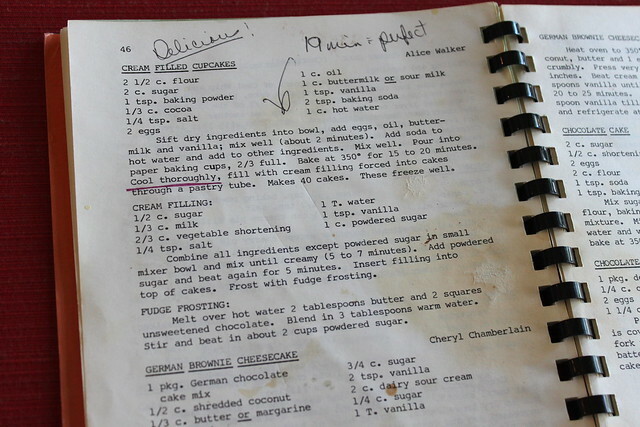 You know you have a jackpot recipe when there are stains all over it! 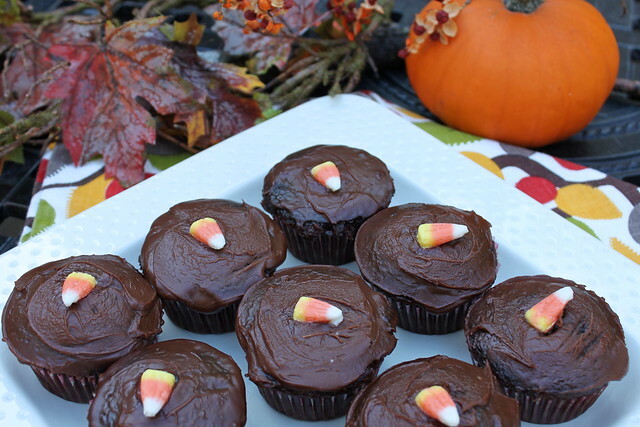 So what we have here are scrumptious from scratch chocolate cupcakes that are piped full of creamy deliciousness and then iced with chocolate fudge icing. Little Debbie would be ashamed to stand next to them. 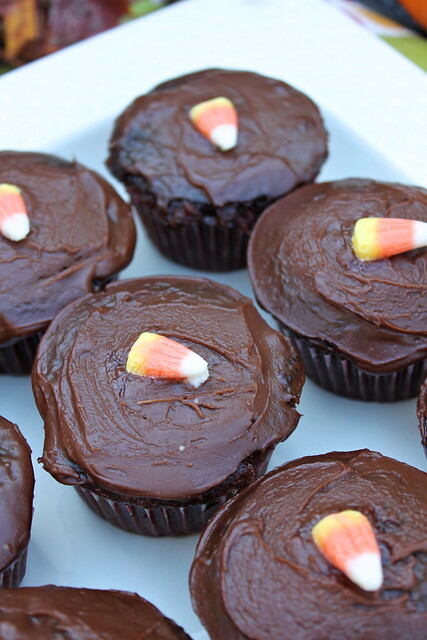 We always seem to make them in the fall and top them off with a candy corn. 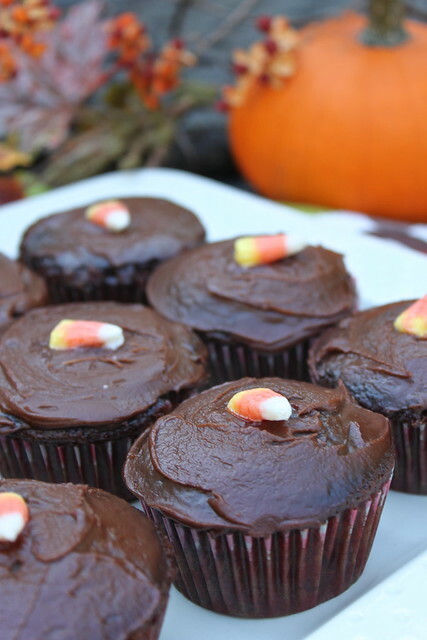 They are a surefire family favorite! 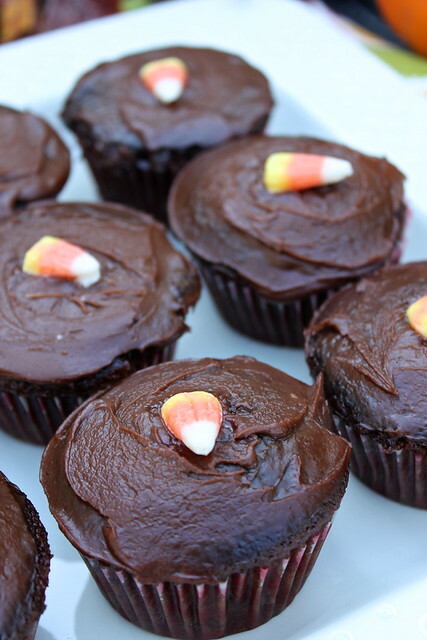 Adapted by Lindsay at Perfecting the Pairing from Circuit Rider's Cookbook and Alice W.
Preheat the oven to 350 degrees F. For the cupcakes, sift together the flour, sugar, baking powder, cocoa, and salt. Add in the eggs, oil, buttermilk, and vanilla, mix well. In a small bowl whisk the baking soda into the hot water and combine with the other ingredients. Mix well. Line a muffin tin with paper liners and fill 2/3 full with the batter. Bake for 15 to 20 minutes until a toothpick comes clean. Allow to cool completely. Should make between 30-40 cupcakes. Prepare the cream filling by combining the sugar, milk, shortening, salt, water, and vanilla in the bowl of an electric mixer. Beat until creamy. Add in the powdered sugar and beat again until smooth and combined. Prepare a piping bag with a pointed tip, fill with cream mixture. Fill cupcakes by poking into the top, you will see the cupcakes puff up a bit, estimate about a tablespoon of filling in each. For the frosting, in a double boiler, melt the butter and unsweetened chocolate, blend in the warm water until combined. Stir in the powdered sugar in batches until smooth. Frost the cupcakes. It`s great. 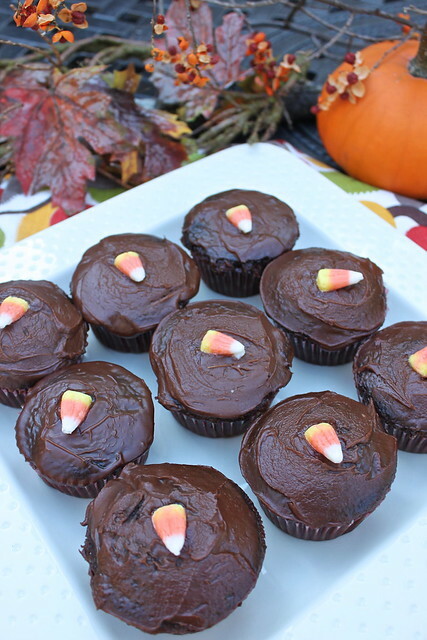 The recipe which you have shared here about Cupcakes is really very nice. If you also want to know more about various type of cupcakes visit Candyland Crafts.